One of the most arduous tasks of owning a property with a grass garden has to be mowing the lawn. The worse your lawn mower is and the size of your garden directly correlate too, making the chore more laborious. Fortunately, we do live in a time where there are robots for doing this kind of thing for you: enter LawnBott SpyderEVO. 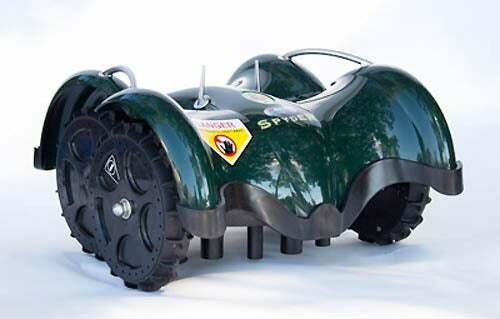 LawnBott SpyderEVO (or the LB1500) by Kyodo America is a funny-looking mower robot that doesn't need your interaction in order to keep the grass short. The autonomous mower works by using perimeter wire and a few sensors to work out where the boundaries of your garden are. If it does meet an object, it'll reverse and maneuver out of the way rather than bumping into it. The LawnBott is designed for those with medium-sized lawns; it will mow 10,000 square foot happily on its own. It's Li-ion battery will last for around 3.5 hours, but a docking station means SpyderEVO will automatically begin recharging once its juices run low. Of course, the main downside to the autonomous LawnBott is that you do need to install the perimeter wire around your lawn before using the machine, or it will collide with your beloved rose bush. While it is available on the consumer market now, it will also set you back $1,800--the docking station is an optional add-on. Personally, it would still be better to get a robot to do this work in a sizable garden so you don't have to, despite the price tag. Just think, while the LawnBot does the lawn, you could invest some time in doing- well, probably more chores. Visit the LawnBott website to see a gallery and video of the SpyderEVO, in addition to other LawnBott models available.